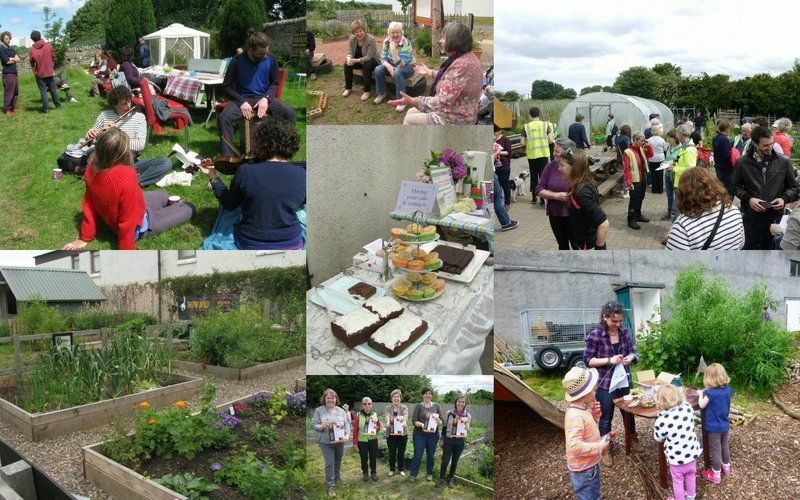 The inaugural Power of Food Festival kicked off the summer with a packed weekend of events and family activities celebrating community food growing across Edinburgh on the weekend of 20 and 21 June 2015. From the four corners of the city, community food gardens opened their gates to the public inviting visitors to try everything from insect hunting to tattie lifting and poetry writing, and offering them the chance to listen to music from local bands and choirs. Of course there was also the opportunity to taste local produce and sample plenty of yummy food! The Festival, which is entirely volunteerrun, showcased 15 diverse garden spaces ranging from transformed wasteland to a farmhouse, connecting different initiatives and bringing people together. With plenty of laughter and a great sense of community spirit, the weekend was even topped off with a splash of sunshine! We all seem to be linked by a joy in being outdoors together and working with the environment. Food at the end of it is just one of the rewards. The first Power of Food Festival saw an estimated 300 visitors over the two day event. It was inspiring with lots of energy, passion and enthusiasm on show in the gardens and lots of interest. Visitors took the chance to learn about herbalism and growing tomatoes, to hear food inspired storytellers, and to pick up some new recipes to try out. A cycle ride led by Sustrans volunteers gave visitors the opportunity to explore a range of gardens while enjoying the capital city’s extensive offroad cycle network. The event also marked the launch of the Edible Edinburgh Charter promoting good food for all. We’d love to hear from you if you have suggestions and ideas for Edible Edinburgh’s work and if you have events, news or links that we can put on the website.